The DSLR Kirk Neff Offset Rig Bundle from SHAPE is a 15 mm rod, shoulder-mount solution designed for DSLR or other compact cameras and comes complete with a matte box and follow focus. The offset design places your camera’s LCD screen in front of your eyes for easier viewing while shooting. At the heart of the bundle are the DSLR Kirk Neff Baseplate 2.0, a rod offset bracket, and a pair of 10″- and 12″-long 15 mm rods. The rig, matte box, and follow focus are supported using an included shoulder pad and dual handgrips. Your camera attaches to the baseplate via a V-lock quick-release camera plate. The plate is also compatible with third party support systems that utilize the V-lock interface. 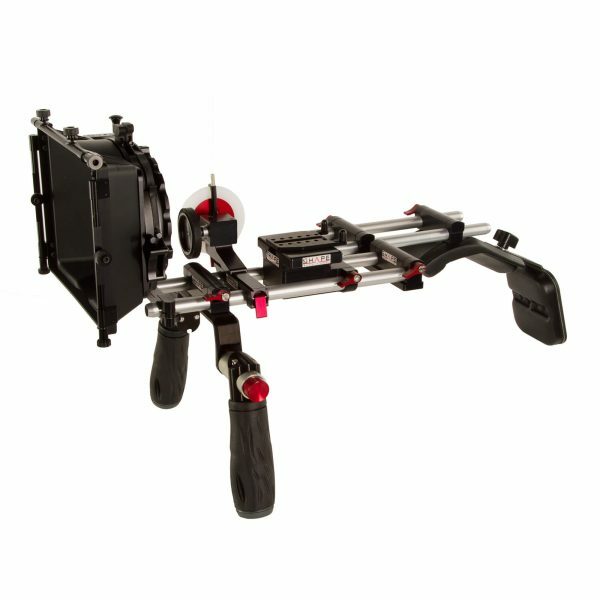 The baseplate provides clamps to support one of the 15 mm rod pairs, allowing you to mount the dual handgrips, matte box, and follow focus in front of the baseplate, as well as the rod offset bracket behind it. The follow focus uses a clamping mechanism to quickly attach and detached off of the rods. It features a removable white marking disc and comes with both a 0.8 pitch gear for interfacing with cine-style lenses, as well as a friction gear for use with lenses that lack built-in gear rings. To block unwanted light from hitting your lens, the matte box attaches to the rods and features a swing-away design for quick lens changes. It comes with a top flag, side flags, and provides two 4×4″ rotating filter stages. The Quick Handle Rod Bloc provides dual handgrip support and features SHAPE’s Push-Button rosette release, which allows you to adjust the angle of the handgrips without having to remove your hands from the rig. At the rear of the rig is the Mini Composite Shoulder Pad which provides padded shoulder support for the rig. It mounts onto the pair of 15 mm rods extending out the back of the rod offset bracket. A Back Pad is included, which attaches to the back of the shoulder pad for augmented camera support and comfort. A 1/4″-20 hole allows for additional accessories or weights to be added. The SHAPE 2-Stage 4 x 4″ Matte Box accepts lenses with up to a 100 mm front outside diameter. It mounts to 15 mm LWS rods and utilizes a swing-away design, which lets you perform quick lens changes without having to remove the matte box from your rods. You can adjust the height of the matte box in relation to the rods, which comes in handy when your lens center to rod center height is slightly off from the standard. Two rotating filter stages support the use of 4×4″ filters. The matte box comes with a top flag (eyebrow), side flags, four matte box donuts in 66, 72, 82, and 90 mm sizes, and elastic donut. The matte box has a rear opening of 100 mm for lenses. The included anti-reflection donuts prevent light behind the camera from reflecting off any filters in the matte box and degrading the image. Included with the matte box are anti-reflection donuts for lenses with a front outside diameter of 66, 72, 82, and 90 mm. The included elastic donut supports lenses with a front outside diameter between 66 and 90 mm, and it is especially useful with lenses that grow and shrink as you change focus or zoom. The side flags incorporate a hook design as a safety feature where they attach to the matte box. This helps prevent them from falling out of the matte box should the lockdown thumbscrew loosen accidentally. The swing-away bracket incorporates a height adjustment, enabling you to compensate a total of 0.65″ vertically. This allows you to use this matte box with a variety of camera/rod support combinations that may vary slightly from the industry standard 85 mm distance from LWS rod center to lens port center. 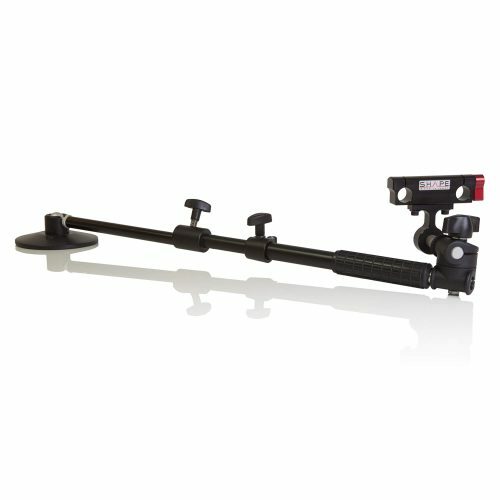 The SHAPE Quick Handle + Rod Block is a professional video stabilization accessory with 2 camera handles, each providing an individual rotation angle of 360°. You can attach the handle to the camera platform using a simple screw knob. A simple Push-Button located at the articulation allows easy attachment and removal. Combined with the anodized aluminum Rod Block, the Quick Handle offers composite camera support for all 15 mm rods. You can achieve precise positioning by sliding the Quick Handle along the rods and tightening the small red knob located on the Rod Block. With 2 screw-threaded holes, the Rod Block provides for attachment of components such as the Quick Handle. 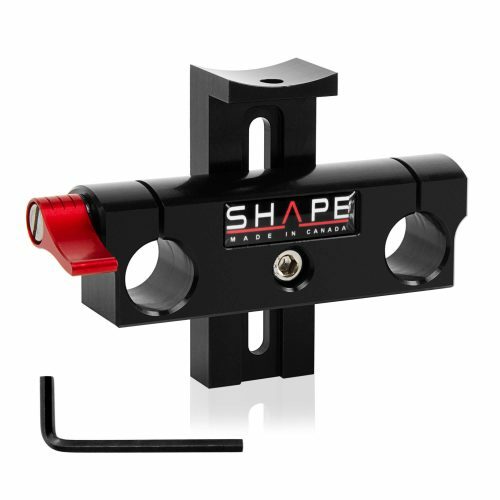 The SHAPE Friction & Gear Follow-Focus Clic with Adjustable Marker is designed to attach onto standard 15 mm rods of shoulder support rigs and other rigs. It attaches onto them via a clamp system, with simplicity. You would sit the Clic atop the rods, and then slide and close a SHAPE-patented lever clamp underneath the rods, and the lever locks and holds the Clic securely on the rods. The Clic’s focus mechanism also works with a clamp system, which when unlocked loosens the focus mechanism and allows it to be moved horizontally. It moves so to adjust itself closer to the lens. As it moves, its main feature — the focus disk — moves with it, and the focus disk is what reaches the lens. The focus disk can either be a friction wheel, as you see in the photo above, or a gear wheel. Both are present in this package and replacing one with the other is accomplished with the help of the included Allen wrench. The friction wheel has a rubber outer surface that would press up against the lens, keep firm contact with it, and ensure accurate and slip-free focusing. The friction wheel would serve well for most lenses and is made of high-quality rubber that in cold temperatures won’t get too cold to lose its grip. The gear wheel would accommodate those lenses that specifically have teeth on their focusing rings, and it would do so without any ring gears, by pressing its .8 pitch gears into the teeth. The focus mechanism can be used on either the left or the right side of the lens, depending on the direction you place the Clic onto the rods in. And the focus disk itself can be used either in front of the focus mechanism, as you see in the photo above, or behind it, so to accommodate a wider variety of lens lengths. To move the disk to the rear, you would first just unscrew two screws from a cube gearbox that you can’t see in the photo above because it sits behind the focus disk. Once the screws are off, the focus disk can just be flipped over for use with longer lens constructions. In the photo above, the white mark disk that you see to the right of the red knob is made of highly resistant Delrin thermoplastic. It can be written on with non-permanent markers to mark up focus measurements for various predetermined shots, and it is interchangeable and thereby many predetermined measurements can be kept ready at your side. Additionally, a slide-adjustable marker made of aluminum is included to be attached beside the mark disk and to be moved and tightened into positions along the disk. The Clic is CNC machined and made of lightweight anodized aluminum for strength and durability. Designed to attach onto standard 15 mm rods. Attaches onto the rods via a patented clamp system. The focus mechanism moves horizontally to adjust to the lens. The focus mechanism can be used on the left or right side of the lens. A friction wheel and a gear wheel are included to interchange as the focus disk. The focus disk flips to the rear of the focus mechanism to accommodate longer lenses. A thermoplastic mark disk can be written on with non-permanent markers and is interchangeable. An included marker attaches beside the mark disk and slides and tightens into positions along the disk. 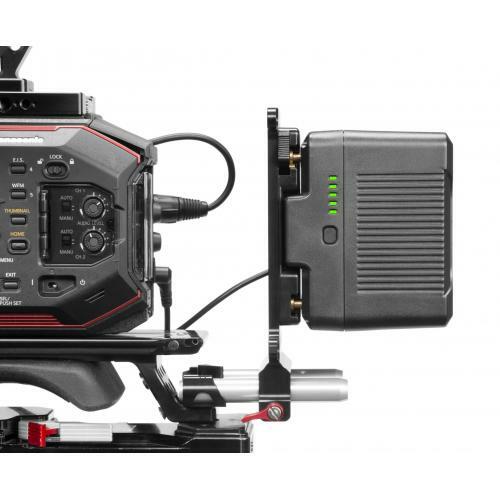 The SHAPE Mini Composite Shoulder Pad is a shoulder pad for the back of your camera rig. Outfitted with a 15 mm-mount SHAPE Rod Block, the pad attaches right onto a pair of 15 mm rods, slides into the best position on them, and tightens in place by a quality lever. It also has a black Screw Knob under which you can add a SHAPE Counter Weight or a SHAPE Back Pad, both optional and both back-supported accessories that work as extensions of the shoulder pad. The Screw Knob’s screw is a 1/4″-20 screw. If you remove the Screw Knob, you’ll have yourself a 1/4″-20 screw hole to add various 1/4″-20-mount accessories into. 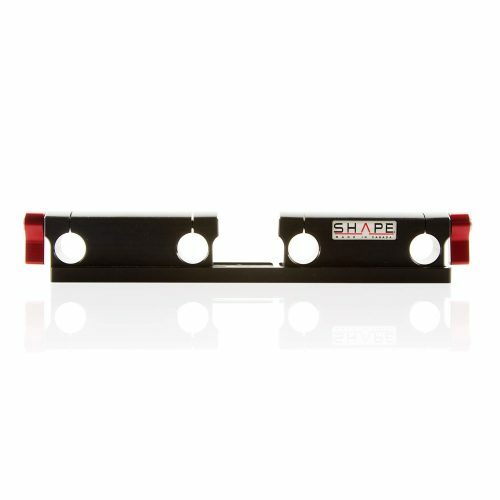 The Back Pad from SHAPE is a standard rig component included with most SHAPE camera rigs. Its design features a powder coated anodized aluminum plate and arm which are attached to a thick padding on the side facing the user. 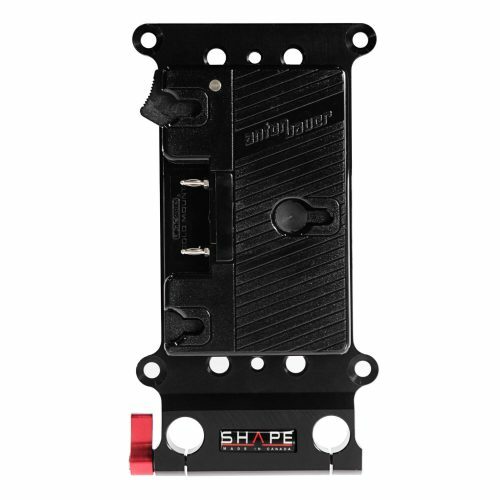 The pad is easy to both attach and remove from your rig, and it supports the SHAPE BOX attachment. Additionally, the pad’s position can be adjusted to the user’s preference – up to 2″ vertically and 360° horizontally.